Kinh (Viet) Ladies wear triangular and the men wear ex-army hats. The Tay – Thai People Includes 8 groups totalling more than 3.9 million. Present since the 18th century, they live in the highlands almost exclusively as dry rice cultivators. Many are now cultivating wet-rice on hill slopes. Agricultural products include maize, rice, vegetables, hemp and cotton. 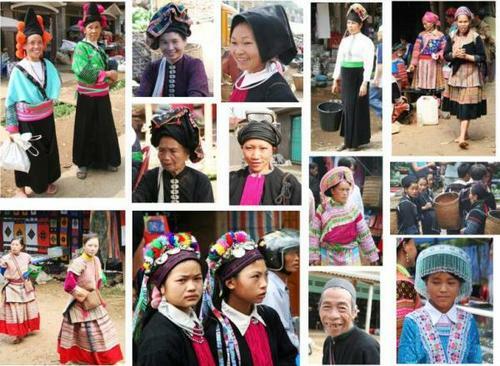 Hmong groups are White, Blue, Black, red and flowered. Every group has its local nuances that are evident in dialects, customs and in women’s clothing. The Red Hmong people are relatively rich tribe. Spend 4 months growing sweet corn, followed by 4 months of dry rice, 4 months off spent partying. Our guide said that it was not unusual for them to grow 20 to 30 tons corn a year (which is on the hillside in the mountains, not in the valleys, as was the dry rice) which they sold for 3m dong per tonne. (which equates to a few thousand £ per year). The grow rice for their own food and don't sell it. Used pack horses to transport goods. In our travels we met up with several of the ethnic tribes and we walked around many of the villages. The people still wear their traditional costume. From our visits to some of the homes it seems that they have one outfit to wear and one in the wash. Some tribes chew an Areca (Batel) nut wrapped in a Betel leaf. It is often combined with limestone and tobacco and chewed like a drug. Regular betel chewing causes the teeth and gums to be stained red or black. It is believed to reduce the incidence of cavities and is often a tribal symbol, however, it is known by educated people that it causes mouth cancer.